Theatre Direct, one of the Country’s leading theatres for youth is pleased to announce the Forward March Festival, a dynamic new festival of new cutting-edge theatre by, for, and about youth taking place March 4-10, 2019 at The Redwood Theatre in Toronto’s East End. The inaugural lineup of featured plays in the Forward March Festival focuses on timely, relevant, and challenging topics that relate directly to the experience of young people. After the loss of her father and a series embarrassing interactions with: cruel classmates, a nosy teacher, a try-hard mother, and a very handsome boy, the ever awkward May Macdonald vows to go on a silence strike. A play about grief, community, and finding your voice. Dirt is a queer coming of age story that follows two boys of opposing ethnic groups growing up as best friends in Urumqi, China. Spanning 15+ years in timeline and set in both Urumqi and Toronto, Dirt explores the intersection between queerness and race, as well as the idea of using power as a violent force. Convinced the world at large can’t be trusted to prioritize the well-being of adolescent girls in the event of a cataclysmic event (or just in general), a determined troupe of 8th grade ‘doomers’ are committed to preparing for survival in the post-collapse society they anticipate inheriting. Judy Blume meets Rambo, WROL (Without Rule of Law) is a darkly comic coming-of-age story for complicated times. Students attending will participate in an engaging full-day programme beginning with a performance reading of the work followed by facilitated discussion and reflection activities led by the director and playwright and drama-based workshops after lunch. All classes attending receive comprehensive preparation packages and a classroom copy of the scripts featured in the festival. This programme is suitable for English, Drama, and Social Studies classes. 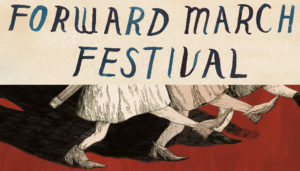 The 2019 Forward March Festival runs from March 4-10, 2019 at the Redwood Theatre, 1300 Gerrard St E, Toronto, ON, M4L 1Y7. Now, in its 42nd season, Theatre Direct Canada is one of the Country’s leading theatres for young audiences whose award-winning productions have reached audiences in schools and theatres across Canada and overseas. Theatre Direct’s work has been recognized with multiple Dora Mavor Moore Awards and nominations as well as 10 Chalmers Canadian Play Awards, and the Canada Council Theatre for Young Audiences Prize.